Jumping into the fire, howling wind, and bombs bursting in air with the uber rock god. How we choose to assess the legacy and presence of Jimi Hendrix probably comes down to what we want from this artist, how (if at all) we can relate to his music, and if the whirlwind of mystical energy and elemental urgency of the recordings released in his lifetime (three albums with The Experience and one with The Band of Gypsies) can match the way his image has been represented and manipulated in the nearly 38 years since his death. More than just the image, the ethereal and cosmic worlds Hendrix created in his recordings, both the legendary cover songs and originals, are still daunting. There's still so much to unpack after listening to a Jimi Hendrix album for the first or millionth time. For a man whose recording career as a sideman and rock God spanned only eight years, until his death at 27, his posthumous releases have cemented the legend. What are we to make of Hendrix in the 21st century when the last hope we ever had of an artist to match his level (Prince) has been gone since April 2016? 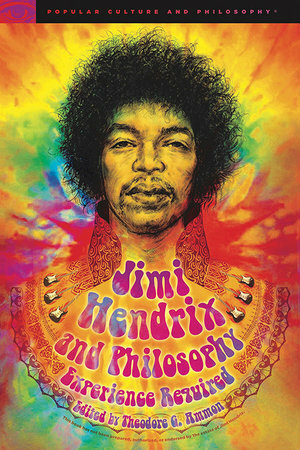 Jimi Hendrix and Philosophy: Experience Required, another in the Open Court Press series of Popular Culture and Philosophy, isn't about comparing or contrasting the legendary left-handed Seattle rock God Hendrix with the diminutive Purple one from Minnesota. Any text that tries to combine the incendiary heat of both those artists will be sure to self-destruct like the conflagration from Hendrix's guitar at the end of his 1967 Monterey performance. Hendrix was (and is) the beginning and end of rock superstardom. If he peaked at the original August 1969 Woodstock with his performance of "The Star Spangled Banner", then perhaps there's validity to the idea that the musical form pioneered by an African-American in the mid-1950's (Chuck Berry) would be put to rest by another at the close of the '60s. Rock 'n' roll didn't die, but it would never be the same after Woodstock. "Hendrix's facility with a Stratocaster is the stuff of legend, but the complexity if his life's explorations of love? Not so much. Reckless and immoral behavior? I have effectively sidestepped the issue and will again here." It's this type of presumptuousness that can get a writer in trouble, especially if they aren't able to deliver. Ammon does manage to draw some interesting connections to the questions Hendrix asked: "Are you experienced?" He has a strong argument about the brooding "Hey Joe", but he fails to note (as others do) that the song itself is a mid-'60s blues/folk standard. It's not an original. The key is what Hendrix did with it. "It looked to me like he's probably there. If not, a lot of people have wasted a lot of pints of cheap whiskey by leaving them on his grave… Maybe Jim comes at night and… I don't know, drinks it or sells it or moves it to Chopin's grave twenty yards away." "The same destruction of the idols (or fingers) that… keeps us from the real experience that they should evoke, can be seen in Jimi's act of lighting his guitar on fire." "The difference between Hendrix's destruction and that of Pete Townshend…is that the latter's is a proto-punk statement against the music establishment from the perspective of 'My Generation.' Hendrix's act is free from violence and means to involve the experience as opposed to the tool." "Let's not trivialize this… The beauty is in the deep recognition of how much suffering people endured. It doesn't glorify war… It awakens us to how horrific it was." Christopher Ketcham probably has the hardest job here trying to put Hendrix's connection to Bob Dylan in a philosophical context. In his essay "A Life Along the Watchtower" we already know that the musical affinity between Dylan and Hendrix was mutual. After Hendrix recorded his version of "All Along the Watchtower", Dylan would rarely if ever perform the song acoustically. Hendrix did for Dylan what Aretha Franklin did for Otis Redding's "Respect". It just feels deeper, though, between Hendrix and Dylan. Hendrix reflects: "I felt like 'All Along the Watchtower' was something I had written but couldn't get together. I often feel like that about Dylan." How does this life along the Watchtower manifest itself? Ketcham notes that Hendrix saw his style as "Electric Church Music", and this song itself drew inspiration from the Book of Isaiah. Hendrix, Ketcham writes, wanted to "…grind the Babylonian craven images of nihilism into the ground." The price for authenticity, or some sort of truth in a cover song, was the launching point for Jimi Hendrix. It does bear noting, as well, that this was one of the elements songs so pivotal to Hendrix. He wrote, sang, and played about the wind, the rain, fire, disaster, bombs bursting in air. Dylan opens that song with the Joker telling the thief there must be some way out of here. Hendrix's version begins with a swirl of dangerous sounds and swirling guitars. The danger remains in his version, but Hendrix also seems to convince us there will be a way out of here, somehow. He stretches and roams through darker corners but we feel confident he'll take us home. Ketcham writes about a passage from Charles Cross's Hendrix biography A Room Full of Mirrors, in which the author "…found a shattered mirror sculpture made by Jimi in the basement of Jimi's father's home. The struggle for Hendrix was emerging from the room full of mirrors, a sanctuary of self-full-ness, of continuous reflection about what he has been…" It's an effective way to examine the fragmented pieces of Jimi Hendrix and how he worked through these issues (race, identity, cosmic potential, war and love) through his music. Jimi Hendrix and Philosophy is a quick read, a mixed bag, but the strongest pieces in this volume overwhelm the rambling ruminations. The image and likeness of Jimi Hendrix is up there with Elvis and Marilyn. Written in extremely small print under the tie-dyed painting of Hendrix featured on this book's title is the legal disclaimer "This book has not been prepared, authorized, or endorsed by the estate of Jimi Hendrix." It brings to mind the issues faced by the makers of the 2013 Hendrix biopic Jimi: All is by My Side. The filmmakers couldn't use any of his original recordings, so they settled for blues covers and a concentrated time period of his apprenticeship in swinging London in the mid-'60s. One scene from that film (cited in this book) speaks loudly to the audacity of young Hendrix. It's June 1967, days after the Beatles released Sgt Pepper's Lonely Hearts Club Band, and Hendrix performs the title track at a packed London show, all four members of the band in attendance. If Hendrix knew he was a shooting star who wouldn't live to burst through the next 50 years (and then some), on that day and at that time, he knew he had nothing to prove and nothing to lose.